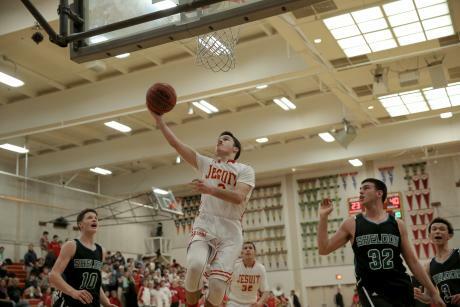 The philosophy of basketball at Jesuit High School is based on the assumption that all players are dedicated to the contributions they can make to the TEAM. If we are to be successful, we must excel in the TEAM aspects of the game. We must be more dedicated than our opponents. We must be in better condition. We must be willing to subjugate personal glory for the good of the TEAM. And most important, we must be tougher physically and defensively than anyone we play. We must also possess a self-discipline and a TEAM discipline based on mutual respect for one another that will enable us to get the maximum TEAM performance at all times.